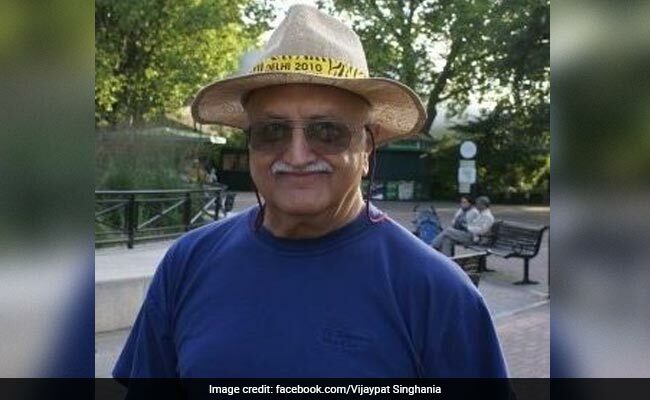 New Delhi: Veteran industrialist Vijaypat Singhania, who built Raymond into one of the best known apparel brands in the country and was one of the richest men in the country, is entangled in a legal battle with his son for a roof over his head. Two years ago, the 78-year-old had handed over a huge part of his assets to his son. Now he has told the Bombay High Court that the company controlled by son has refused to give him possession of a flat in the redeveloped 36-storey house in Mumbai's posh Malabar Hill. Before he stepped down, Mr Singhania, was the Chairman Emiratus of Raymond. He is also a keen aviator, who has written a book on flying. In 2015, he had given away his 37.1 per cent stake in the company -- worth more than 1000 crore -- to his youngest son, Gautam Singhania, triggering a legal battle with his Singapore-based grandchildren. Two years down the line, reports say he is living in a rented accommodation - the company has refused to reimburse him for the rent, which is Rs 7 lakh a month. According to a 2007 family agreement, Mr Singhania, his son Gautam, and the widow and two sons of Vijaypat Singhania's brother Ajaypat Singhania, were to get a duplex each in JK House, a family property, reported news agency Press Trust of India. In his petition, Mr Singhania said his son was occupying greater area in the JK House than he was entitled to. He also said that Raymonds failed to respond to his offers of payment to get possession of the duplex. The court has asked the father and son to resolve the issues amicably. "Such matters should not have reached the courts in the first place. These are disputes between a father and son," said Justice GS Kulkarni during a hearing this week, reported PTI.